I have an Xbox 360 Wireless Receiver that I ordered from China. I believe it's a counterfeit as Microsoft had already discontinued the device long before I bought it. Because of this I believe the driver's inf file was modified by the seller. 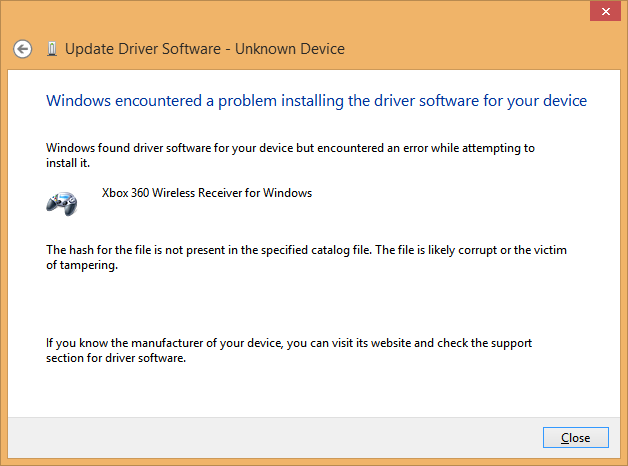 This wasn't a problem in Windows 7, but the device showed up as "Unknown device" after upgrading to Windows 8 Pro x64. How can I get Windows to ignore this issue and take the driver? Alternatively, you could check if the Driver Signature Overrider tool works under Win8. Windows Key + W and enter "change advanced startup options". Follow the Troubleshooting options until you reach Advanced Boot Options. Finally choose Disable Driver Signing Enforcement and install the drivers. It will be renabled upon a fresh reboot. Not the answer you're looking for? Browse other questions tagged drivers windows-8 or ask your own question. How to manipulate LAN driver files to accept Windows Server 2012?